You want to pursue an inbound marketing strategy. You’ve already chosen a product like Hubspot as your Marketing Automation platform (if not, this post on how to choose a marketing automation platform might be helpful). But you know that you also need to invest in Content Marketing in order to generate those inbound leads. So how do you do this in a cost-effective manner? The answer is Content Marketing Syndication. In the sense of generating content for your own distribution channels, it is just as critical. This is the process, or art, of strategically creating owned content that can be adapted and distributed across a variety of mediums. 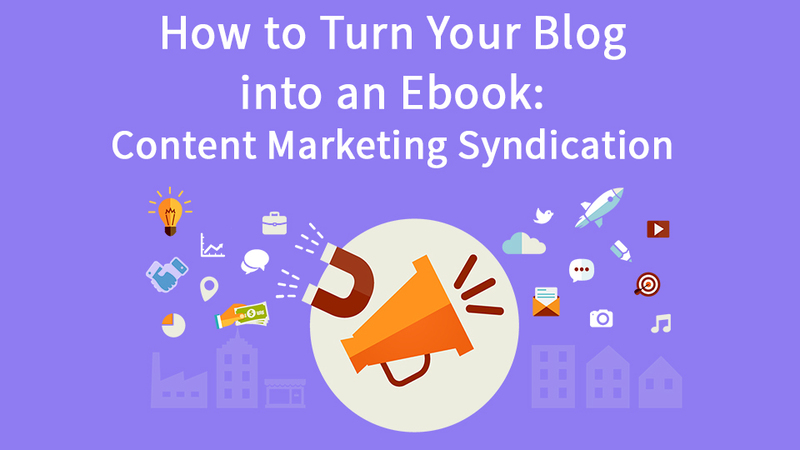 If done right, your blog posts can be syndicated to create dozens of social media posts, a case study and then combined into longer form content, like an Ebook or How to Guide. So how does this all fit together? Let’s imagine we want to write an ebook. Instead of trying to sit down and pen the whole thing (which never happens), we select a subject in advance and break it down into chapters. If your chapters are in the 600-800 word range, each one can first be written and published as a blog post. Then by combining about eight posts, you can create an ebook of a reasonable length. How breaking content down into smaller pieces (or combining it into larger pieces) to save on resources intuitively makes sense. How it increases the SEO value of the content isn’t as apparent, but in the long run, may be more important (more on how we help companies with their SEO efforts here). To return to our ebook example. If we decide to write an ebook called “Marketing Automation for Dummies”, we would want to pre-plan and break that into a series of blog posts about marketing automation, tagging them systematically and combining them all under a related category. Doing so in a blogging platform like WordPress will not only create a series of blog post pages (one for each post), but also a series of tag pages (and perhaps a category page) that contain a large amount of content about Marketing Automation. All updated in a concentrated period of time and linked to one another. We would also share each of those blog posts across our social media properties. By combining all these efforts and linking the content, we are going to create a lift in the SEO value of all the pages and posts for the terms we are targeting. Once those blog posts are combined into an ebook, we would embed an ad unit for the ebook at the bottom of each post, driving to a lead generation orientated landing page. People who end up on those posts during visits from organic search are highly likely to be interested in the content of the ebook, generating easy conversions, because it is about what they searched Google for in the first place. The overall goal of content marketing syndication is to use a small amount of upfront planning about the content that is generated, so that reuse generate savings in creative costs, improves the SEO value of content and increases the amount of content that can be generated with limited staff resources. Still not convinced you need to be generating content marketing and marketing automation? Read this post, Why You Should Use Marketing Automation. Interested in learning more about Marketing Automation? Click here to get in touch. CloudKettle is a consultancy that specializes in helping B2B SaaS companies build and optimize their Revenue Stack. From demand generation through to renewals, we help manage the growth of billions in sales pipeline for our clients. We do this by optimizing their instance of Salesforce and enhancing the performance of the Lead Generation, Marketing Automation, and Customer Support and Success tools it integrates with. As a Google Premier Partner, Salesforce Silver Partner, and Marketo Silver Partner, we have deep, real-world experience improving clients’ ROI from tools like Salesforce, Marketo, and Google’s Marketing Suite.